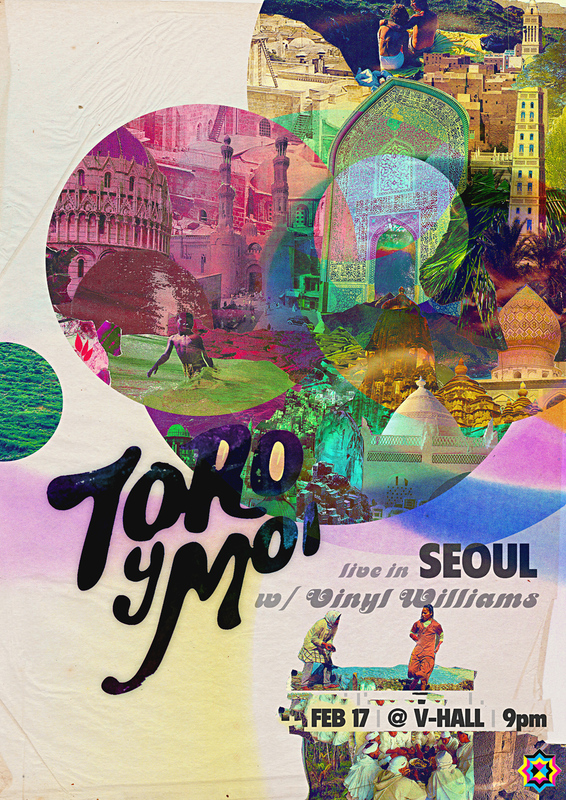 Toro y Moi is back to Korea with an accomplice! Toro y Moi is the moniker of 24-year-old Columbia, Chazwick Bundick, backed by a full band on tour. Toro Y Moi is constantly evolving. While heavily influenced by his parent’s vinyl and tape collection, the sound stays true to his contemporary influences of Animal Collective, Sonic Youth, J Dilla & Stones Throw hip hop, and Daft Punk, and cumulatively leading the new class of musicians deemed chillwave in genre. Last year’s “Causers of This” as well as the newer “Underneath the Pine” have drawn considerably praise and a ravenous fanbase, in Korea and abroad. His first shows in Korea this June garnered love from hundreds of fan as well as some kind print in NYLON Korea, and the cover of STUDIO 24. His newest EP “Freaking Out‘ just dropped with an 8 on Pitchfork and tons of dislocated shoulders from all the grabbage. 올해 6월에 와서 여러분에게 청량한 여름을 선사했던 그가 내년 2월, 다시 Super Color Super를 통해 다시 내한한다. South Carolina의 Columbia에서 태어나고 자란, 장난끼 가득한 얼굴의 24세 청년 Chaz Bundick (Toro Y Moi) 는 어린 시절부터 다채로운 악기들을 장난감 삼아왔다. 그의 음악 생활의 초반기는 펑크와 인디 락으로 메꿔졌으나, 2001년을 기점으로 그는 일렉트로닉과 더불어 다양한 장르의 음악들, french house, 80s R&B, hip-hop 등을 두루 섭취하며 자신만의 솔로 프로젝트에 집중하기 시작한다. 그래픽 전공 학생이었던 그가 the University of South Carolina 를 졸업하던 2009년, Chaz는 그의 음악을 완벽히 자신만의 스타일로 완성하는 데 이르렀다. 그는 Washed Out, Neon Indian 과 같은 뮤지션들과 함께 Chillwave 라는 장르를 보다 깊이있는 스펙트럼으로 끌어내고 있다. 6월 내한 후, 그는 Freaking Out EP에서 좀 더 funky한 요소를 그의 음악에 추가함으로써 추운 겨울 댄스플로어를 후끈 달아오르게 할 만한 리듬을 안고 다시 찾아온다. Toro Y Moi는 오는 2월 내한해 여러분에게 다시금 따뜻한 여름을 느끼게 해 줄 것이다. 사정상 약간의 변동이 생길 수 있습니다.